Pack assembly that can be used as a backpack or a hip pack. 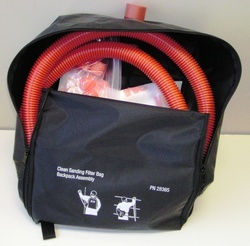 The pack holds our 3M™ Extra Large Clean Sanding Filter Bag along with the other components used to connect the 3M™ Self-Generated Vacuum Random Orbital Sander to the Filter Bag. The assembly consist of the following: PN28301 1"x6' Vacuum Hose, PN30442 Vacuum Hose Swivel Adapter, PN20453 Filter Bag Adaptor, PNA0778 Hose Seal, PN28364 Clean Sanding Filter Bag - XL, 5 End Caps.